Max Hess played the obbligato horn part for the premiere of Mahler's Fifth Symphony, under the composer's direction, and he was the last living student of Friedrich Gumpert. Hess was born in 1878 in Klingenthal, Saxony, Germany, the oldest of eleven children. His father wanted Hess to follow him into business, but Hess instead attended Leipzig Conservatory (1896-1899), studying with Gumpert. After graduation, he played first horn in the Rostock Opera for one season, performing an amazing number of operas, all on a single F horn and without an assistant. At one point, he played thirty-two nights in succession, including the entire Ring and Tristan und Isolde, plus sixteen rehearsals. The next year, he played first horn in the Cologne Opera. The following year, he won the first horn position in the Gürzenich Orchestra in Cologne, which included a teaching position at the Conservatory, where he stayed until 1905. In 1905, Hess was offered positions at the Queen's Hall Orchestra, London and the Boston Symphony Orchestra. He accepted the Boston job and was first horn until 1913, then, because of an accident to one of his front teeth, he moved to third horn until 1925. Also in Boston, he played the Mozart Quintet K407 in 1905 with the Hoffman Quartet and formed the Boston Symphonic Horn Quartet, which was active around the time of World War I. 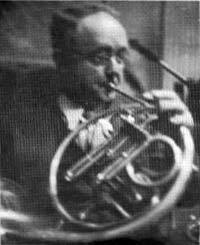 In 1925, after having his broken tooth repaired, Hess moved to Cincinnati as first horn in the Cincinnati Symphony under Fritz Reiner and taught at the Cincinnati Conservatory. When he retired in 1938, he returned to Boston. He attended concerts at Symphony Hall and entertained horn sections of visiting orchestras. He was known throughout his life as one who enjoyed social life, fine restaurants, visiting with friends and (in his later life) his membership in Schlaraffia Bostonia. Hess had a reputation as a very secure and accurate player. He started on hand horn, then played a single F Bopp until 1913 when he brought the first Alexander double horns to the US. His recordings include a 1910 Edison cylinder of a cornet solo with horn quartet, a recording of a broadcast of Mozart's K447 with the Cincinnati Conservatory orchestra, and a private recording of the Strauss Concerto No. 1. While visiting Leipzig at age 91, he presented the Conservatory with a pair of new horns, and they gave him an inscribed medal with the likeness of Mendelssohn. Hess was elected an IHS Honorary Member in 1971.